Unlike summer squash, winter squash isn’t harvested a little at a time as they ripen. They don’t rebloom and produce until you pull them up by the root because you can’t use or give away any more of them. Winter squash remains on the vine until all the fruit on the vine is fully ripened. Generally, they’re left in the field until the first frost comes. Once frost has arrived, it’s time to harvest and store them all at one time. There is one thing to be aware of, you must be careful to never let winter squash freeze. If they freeze, they will immediately be spoiled. Some varieties of winter squash are more popular than others. The most popular among homestead gardeners are butternut, acorn, pumpkin, spaghetti, hubbard, buttercup, and turban. Although Turban can be used like you would butternut and acorn squash, it’s most often used as a decorative winter squash. My personal favorite winter squash is the pumpkin. When the boys were little, we used to scratch their names in a green pumpkin. You barely scratch the skin of a green squash, it will heal over the scratches making raised scars in the rind in the shape of the scratches. When they were ripened in the field, the boys had great fun looking for the one with their name on it while we harvested. They never suspected they were actually working. You can read more about growing pumpkins and preserving them here. Winter squash is more nutritious than summer squash. They are high in Vitamins A and C. Other nutrients found in winter squash are calcium, iron, magnesium, vitamin B6, copper potassium, vitamin B2, vitamin K, vitamin B3, and omega-3 fats. They are also high in fiber. Like all other gardening chores, planting time for winter squash depends on your gardening zone. The thing is, winter squash requires a long growing season. The growing time varies between the varieties ranging from 80 – 120 days. Pumpkins, for instance, take 120 days. This is just one of the many reasons to know your gardening zone. Plant your winter squash when you have the required number of days before the first predicted frost. Remember, frost dates are estimates based on weather history averages. Another tip I would offer is to not plant winter squash in containers. Unlike their bushy summer squash cousins, the meandering vines of winter squash make them a poor choice for container gardening. When planting winter squash, be sure to account for the space you have available and the space requirements for the varieties you’ve chosen to plant. Plant winter squash seeds about an inch deep. I usually put 3-4 seeds in a hill. The old adage, “One for the mole, one for the crow, one to rot, and one to grow,” comes to mind every time I plant. There are many variations of this saying, do you know another one? Your hills should be 4-6 feet apart depending on the variety you plant. We plant butternut, spaghetti, and pumpkin winter squash. Our squash hills 6 feet apart. We do this to allow plenty of space for the vines and fruit. Other people swear by 4 feet so you have to decide what you have space for and go with that. Viable seeds will sprout within 7-10 days. Be sure to keep your winter squash well watered, especially once they start producing fruit. Their water requirements are high while growing and ripening fruit. Like summer squash, winter squash will cross pollinate within the same family. If the varieties you choose are in the same family, you should practice succession planting. Allowing two to three weeks between the planting of each variety and provide plenty of space between beds will help prevent cross-pollination. I’ve never had a problem with the cross-pollination of winter squash, but our garden has always been large enough to allow me plenty of space between varieties. If you don’t have a lot of space to prevent cross-pollination, succession planting is a good option. Using raised beds with adequate spacing between them has proven successful in preventing the problem as well. Best estimates to prevent cross-pollination are ¼ mile or about 1,000 feet. I have to tell you, mine are nowhere near this far apart. Winter squash can remain on the vine in the field until the first frost. They should never be allowed to freeze! The vines will be dried up and die when they frost, if not before. Cut the squash away from the vine at least 1” away from the fruit. In gardening zone 8, I leave winter squash in the garden up to 2 weeks after cutting them away from the vine. This allows them to cure. If you do this, you must watch the weather closely just in case of a freeze. Curing is critical to ensuring winter squash are ready to be stored. If you can’t leave them outdoors to cure, bring them into the warmest area available in your home or heated outbuilding. Warm temperatures, especially 80-85 degrees F, will allow the rinds to get hard and heal any superficial cuts. If there are any squash with deep damage, use those first. Do not store damaged squash with undamaged squash you plan to over winter. As the damaged ones decompose, they will cause the healthy fruits to rot. We share damaged or otherwise undesirable fruits with our livestock. From chickens to pigs, most all livestock enjoy winter squash. Cut them into pieces, I have used a machete to do this, and feed the squash to them. In the old days, many farmers grew winter squash for their livestock as a source of winter feed. This was especially true of those who couldn’t grow grain or enough grain to feed livestock through the winter. We do this for our livestock as we don’t feed much if any grain. 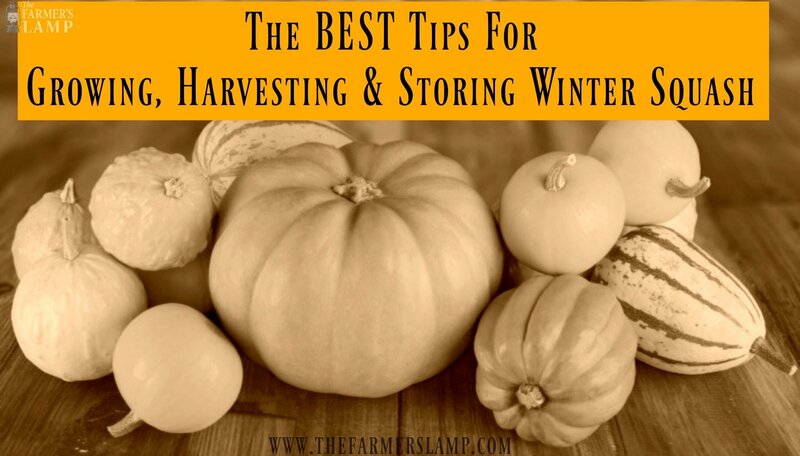 Storing is the only “difficult” part of raising winter squash for some homesteaders. This is because of the storage space required for their larger size and numerous fruits. When storing winter squash there are a few things to keep in mind. Don’t let them freeze – when the fruit thaws it will be mushy and inedible for humans. Don’t store in damp places – like your root cellar unless you have a high-tech humidity controlled one. Attic spaces or lofts are often used for winter squash storage because heat rises. It’s best if the stored squash doesn’t touch each other – they will rot first in the spot they touch. Do check your stored squash regularly – immediately use or remove any which show signs of bruising or rotting. Consider every inch of space available on your homestead when thinking of storage possibilities – as long as they won’t freeze or won’t be exposed to moisture in an area, they can be stored there. Many people spend the winter canning or drying their winter squash. Some people freeze them. We no longer use a freezer for food preservation because we have experienced great losses with power outages. 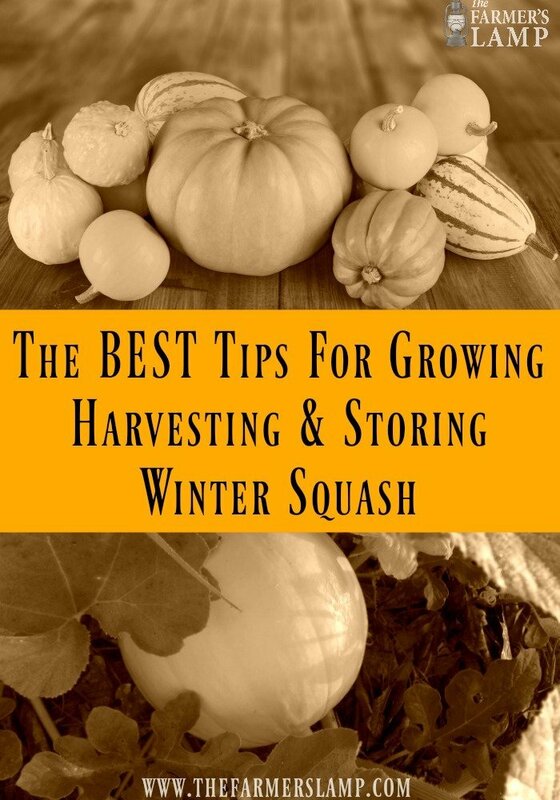 I personally use winter squash fresh from storage through the winter. The winter squash we plant have been excellent keepers and are still good for our use in early March. We use a great deal of them to supplement the winter feed for our livestock. When it’s especially cold out, I like to cut a pumpkin in half, bake it and give it to the chickens and turkeys for breakfast. Of course, I let it cool off some first. Saving seeds from winter squash is as easy as it gets. We practice selective breeding in our garden just like we do with livestock. This means we only keep seeds from the healthiest plant and fruit for ensuring the best crop. When you cut open a ripe squash, remove the seeds. Place them in a quart jar and fill it with water. Cover the jar mouth with a dish rag or towel and let the jar sit on the counter for about 24 hours. The pulp will slip away from the seeds during this time. Fertile seeds will sink to the bottom and undeveloped, infertile seeds will float with the pulp. 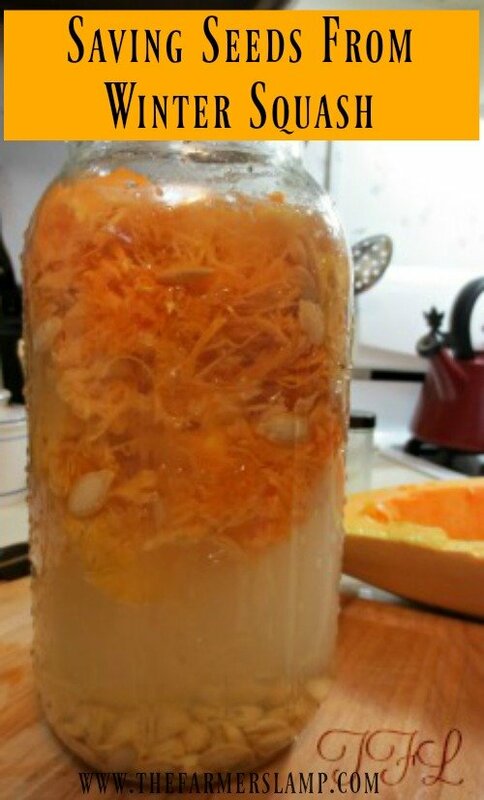 Remove pulp and floating seeds. Rinse the good seeds and lay them out in a single layer on a towel. Place them in a warm area to dry. I turn my seeds every now and then and allow them to dry for a couple of days. Store your seeds in a cool, dry environment. I keep mine in natural seed envelopes and glass jars with tight lids. They have been viable up to 7 years. For more tips on saving seeds from your garden, read our article here. We’ve talked about using winter squash as livestock feed, but what about for people? My goodness, the recipes are endless. They can be baked, boiled, mashed, and fried. They are good in everything from pies and soups to casseroles and stuffings. Their seeds are highly nutritious and a personal favorite around our house. Do you have a favorite winter squash? How about a favorite winter squash recipe? Please, share your tips for growing and storing them with us. I always love a new recipe to try for winter squash.